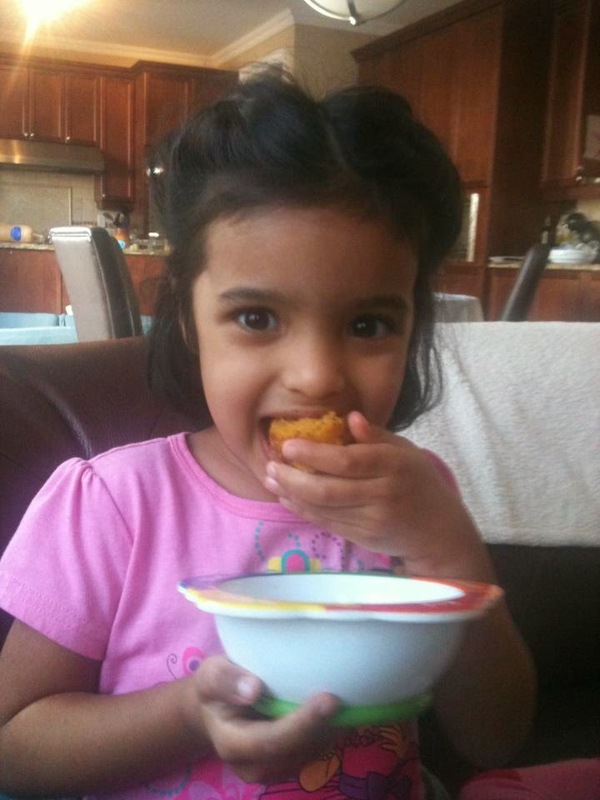 it's my girls' world: Pumpkin poppers, anyone? I'm not the biggest pumpkin fan-- I must admit. I will never willingly eat a piece of pumpkin pie. If I see pumpkin flavoured goodies in the grocery, I probably won't choose one for myself. But D loves pumpkin and so does C-- so because I want to be the cool mom and wife, I take one for the team and scour Pinterest for pumpkin recipes. 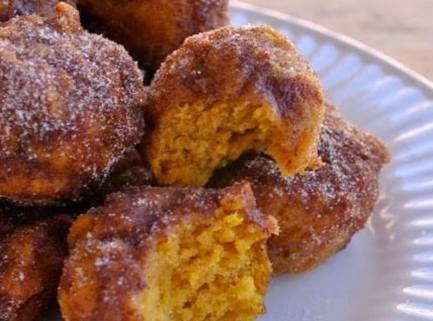 A couple years ago, these pumpkin popper recipes were surfacing throughout the WWW so I decided to give it a go. My word... even the non pumpkin lovers among us (me) became friends with this recipe. The delicate spices and flavour of pumpkin really complimented each other really well. So my friends in honour of fall, I give you pumpkin poppers. Taken from The Clever Housewife but adapted (to make it a bit healthier) by me. 1¾ cups all-purpose flour- I use 1 cup whole wheat and 3/4 white and you really can't taste it. PS> You can save the rest of the pumpkin from the can for chocolate chip pumpkin pancakes-- another goodie. Maybe I will post that one next week! This was C a couple years ago. She could.not.stop.eating.them. Neither could my dad who came to visit. And let's not talk about D. Really, let's not. Linking up today with the lovely ladies, Kate and Emily for Tasty Tuesday. These are right up my alley. I don't like pumpkin pie but I like it in other things. I'll have to give them a try. These look so good!!! Definitely going to try it! I am not a bug pumpkin fan either but these sound good in small doses. Im a a big fan of pumpkin so these sound very amazing! Thanks for linking up your recipe! Oh my word. This recipe looks heavenly. I'm a pumpkin fanatic, and this is something I'd love to try out. Thanks for sharing at DDT! Those look sooooo delicious definitely need to save for future try! Yum! I have been wanting to try making these for a while now. And I'm all for adapting recipes to make them just a little more guilt-free! These look great! This is for sure on my fall list of things to try! Thanks for sharing! These look TO.DIE.FOR!!! I love pumpkin recipes in the Fall. Can't wait to make these. Thank you for sharing this recipe with us on The Blended Blog! I have pinned it and hope to try it in the next few days. Sounds like pumpkin heaven.